Zamil Industrial Investment Company (Zamil Industrial) announced contract wins in recent weeks by three of its Zamil Steel firms – Zamil Towers & Galvanising Co Ltd, Zamil Structural Steel Co Ltd and Zamil Process Equipment Co Ltd The contracts are worth a total of $54.23 million. Zamil Towers & Galvanising Company was awarded a contract worth approximately SR134.5 million ($35.88 million) by the Middle East Engineering and Development Co Ltd (Meedco) to supply lattice towers and gantries for a 380 kV double circuit overhead transmission line between Tabuk Bulk Supply Point (BSP) and Tabarjal BSP in the northern region of Saudi Arabia. The duration of the contract is 16 months, with the company set to begin supply of the towers and gantries in the fourth quarter of 2014. Shipments will continue until the completion of the project, which is expected to occur near the end of the fourth quarter of 2015. According to the contract, Zamil Towers & Galvanising Company will supply over 26,000 tonnes of lattice steel towers and low-level gantries for the construction of the overhead transmission line, which is owned by the Saudi Electricity Company (SEC). The project will link the generating plants in Tabuk and Tabarjal and streamline the operation of the kingdom’s electrical power system by facilitating the exchange of electricity between regions. Zamil Towers & Galvanising Company has been providing design, manufacturing and hot dip galvanising of lattice steel structures for power transmission lines and telecom companies, gantries, and support structures for substations since 1985. The company also provides type testing of power transmission line towers at independent test stations in compliance with international standards as well as telecom and IBS passive and active solutions. During its 29 years of operation, Zamil Towers & Galvanising has supplied approximately 1,000,000 tonnes of lattice steel structures, most of which have been exported to 35 different countries around the globe. The other contract, won by Zamil Structural Steel Company, is worth SR39.5 million ($10.5 million) and has been awarded by Dragados Gulf Construction Company Ltd for the supply of pipe racks and equipment-support structures for the National Methanol Company (Ibn Sina)’s polyoxymethylene (POM) plant project in Jubail Industrial City in the eastern region of Saudi Arabia. According to the contract, Zamil Structural Steel will fabricate and supply over 4,500 tonnes of pipe racks, equipment-support structures and other steel products for the project. Ibn Sina is a manufacturing affiliate of the Saudi Basic Industries Corporation (Sabic). The project is an expansion of Ibn Sina’s existing operations and is a joint venture between Sabic and CTE Petrochemicals Company, which is owned by Duke Energy and the US specialty materials company Celanese Corporation. The POM plant at Ibn Sina is expected to have an annual capacity of 50,000 tonnes. POM is primarily used in automobiles, electronics, food processing and other vital sectors that hold substantial value to Saudi Arabia’s downstream sector development. Known worldwide as the Middle East’s leading structural steel fabricator, Zamil Structural Steel was established in 1983 to provide expertise in the fabrication and installation of structural steel and plate works for a wide range of industrial and commercial applications. The company has gained the confidence of major international engineering, procurement and construction contractors and has built a solid reputation among its customers as a preferred partner for structural steel solutions. The third contract, won by Zamil Process Equipment Co, is worth approximately SR29.4 million ($7.85 million). It was awarded by STF SpA Italy to supply steam drums of various sizes and capacities for the Riyadh Power Plant 13 (PP 13) and Riyadh Power Plant 14 (PP 14) project. Zamil Process Equipment will supply 36 steam drums (high pressure, intermediate pressure and low pressure) that weigh approximately 1,800 tonnes in total for the PP 13 and 14 combined cycle power plants project owned by the Saudi Electricity Company and located near Riyadh. The shell thickness of each high-pressure drum is 120 mm and the material used for construction is SA 299 Grade B. Each plant will have a capacity of between 1,600 and 1,950 megawatts and consists of two blocks, with each block composed of three gas turbine generators, three heat recovery steam generators and one steam turbine generator. The gas turbines are capable of operating in a simple cycle mode through the use of a bypass stack and also in a combined cycle mode. Zamil Process Equipment Company was established in 2003 and offers a large production capacity with expertise in the manufacturing and maintenance of various industrial products, providing life cycle solutions for critical heat and mass transfer equipment for clients in Saudi Arabia and the Middle East. 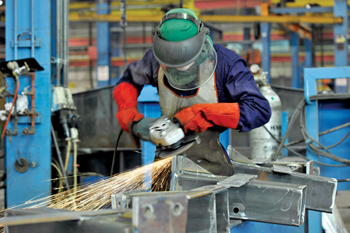 The company’s fabrication area of over 100,000 sq m offers a production capacity of 15,000 tonnes per year, enabling the company to undertake major mechanical contracts that service a wide variety of heavy industries and process plants, including petrochemical plants and refineries, steel and aluminum mills, fertiliser plants, desalination plants and power plants.